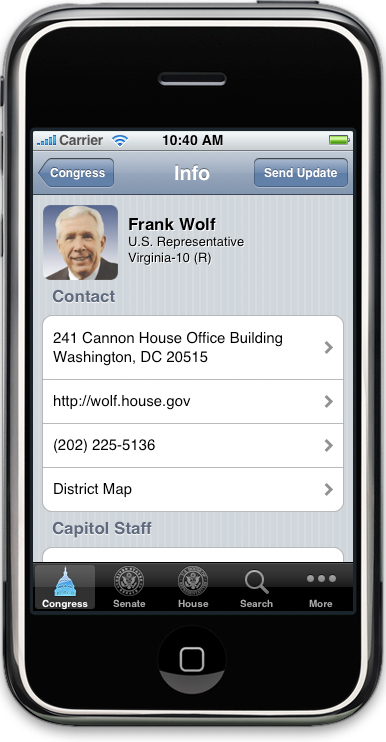 We publish the leading mobile directories of elected officials and their staff for the iPhone and BlackBerry. 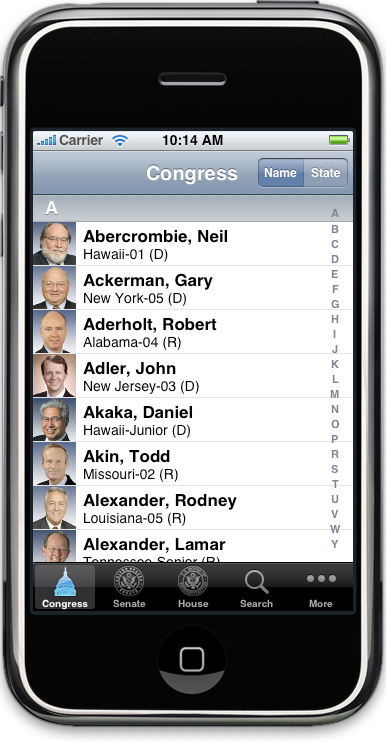 Congress in Your Pocket for the iPhone, iPod Touch, and iPad (soon) offers you the quickest and most comprehensive directory along with plenty of eye candy. Use the directory that has been hailed as the best in its category by Macworld and recommended by members, lobbyists, and activists. Start with Congress, which has a limited database but at 99¢ provides a great introduction to the Capitol. 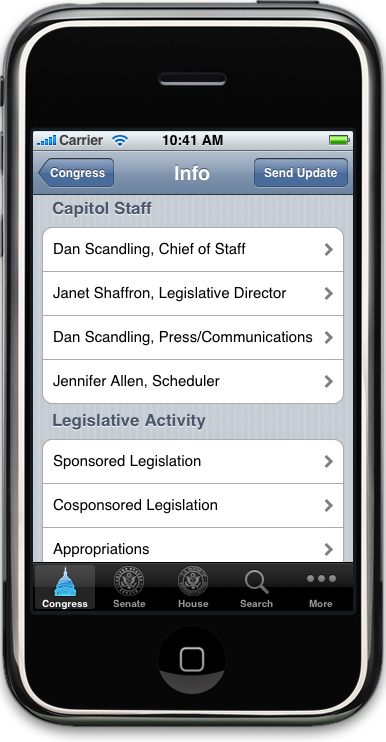 Move up to Congress+ for $9.99, which adds staff and committee information. 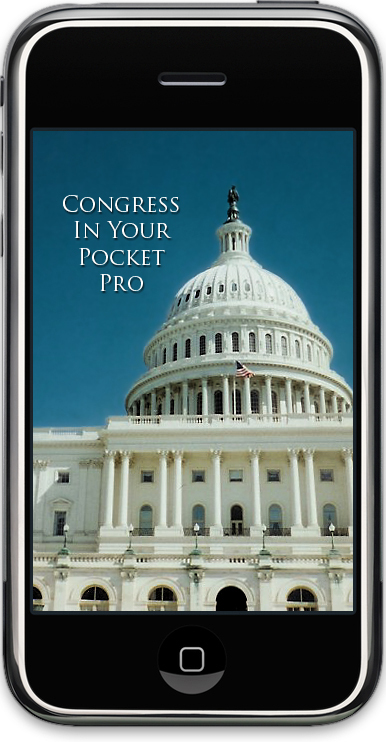 If you’re a professional, choose CongressPro, a great value at $29.99, and you’ll be up-to-date all year and have separate lists of every committee and subcommittee in Congress. 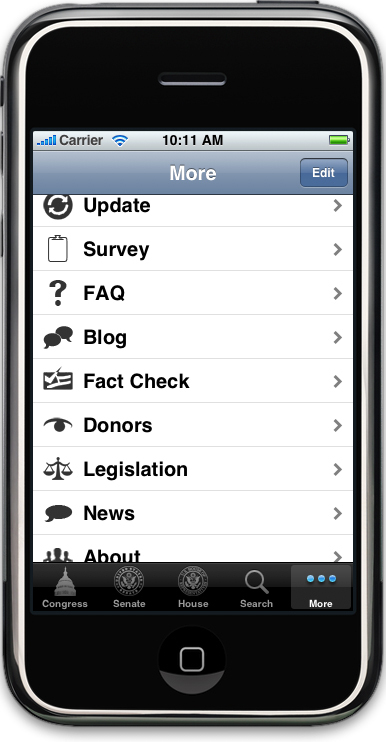 The following screenshots give you examples of what the application looks like on an iPhone or iPod Touch. We have several more available here. For a free four-week trial, please send us a note. All three icons and the splash page. 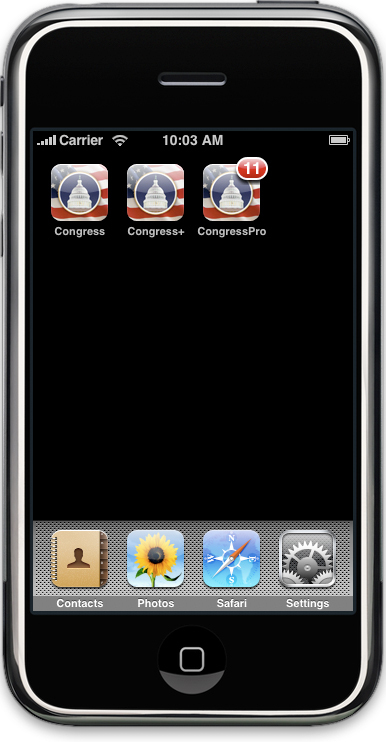 Note that the CongressPro icon has a number in a red bubble. This shows how many updates were downloaded in the background since you last used the application. 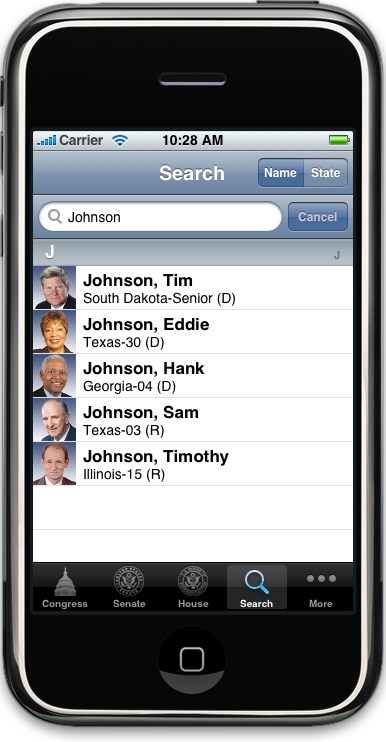 Select the member of Congress you want to view from a list or go directly to there with a search. You can use the links to call an office, tap on an address to open a Google map, website, or Twitter page. Share any link in the application via email, in Facebook, or post it to Twitter. Send email to staff by tapping on their names. Scroll down and you can check out sponsored or cosponsored legislation, committee assignments, campaign and biographical information. You can bookmark members and, coming soon in CongressPro, take notes and share them. There are plenty of quick links to sources in our More section.